As rapid improvements have occurred in the technique of the balloon finding the precise place and dilating the blocked sinus to the optimal size, the balloon sinuplasty procedure has migrated from the hospital to the outpatient surgical facility and finally to the office. As the procedure has become gradually quicker and more comfortable, it has greatly increased in popularity. Current indications for balloon sinuplasty are based on patients having clinical and CT evidence of chronic rhino sinusitis which have not responded to conservative medical management. Those symptoms may include nasal obstruction, congestion, headaches, facial pressure, decreased ability to smell, nasal drainage, and recurrent sinus infections. The sinus specialist evaluates the patient with a history of symptoms, physical exam, nasal endoscopy (the placement of a small light fiber into the nose to visualize the nasal cavity and the outflow tract of the sinuses), and a CAT scan of the sinuses. The evolution of the balloon sinuplasty technique has been done in order to maximize patient comfort and convenience and to facilitate quick recovery and return to full activity. When balloon sinuplasty was introduced in 2005, the placement required fluoroscopic guidance. This entailed a cumbersome procedure in the hospital or surgical facility with an x-ray fluoroscopic machine in the operatory to guide the balloon. This procedure would typically take between one and two hours depending upon the sinuses treated. Significant advances in balloon technology began with a guided wire with a bright light which ‘transilluminated’ the skin when it was successfully introduced into the sinus. Instruments were developed which either enabled a thin wire to be guided into the blocked sinus or a very thin rigid instrument being guided. Since 2014, stereotactically guided balloon technology has been available. 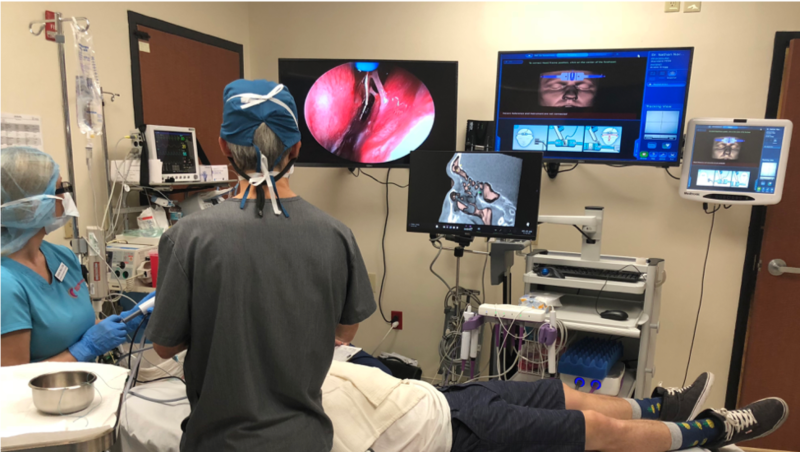 Initially only available on the rigid instrumentation, it has now evolved to enable the surgeon to use the patient’s own CAT scan of the sinus previously obtained to help precisely guide the wire to maximize placement. The balloon sinuplasty experience has evolved along with the technology. The procedure is performed in the office setting either under local or with conscious sedation. The patient reclines in a comfortable chair and the endoscope is used to visualize the inside of the nose while the wire is precisely placed using computer guidance. An audible sound is triggered by the computer when the wire has found the precise desired location. The balloon is then advanced over the wire, inflated, deflated, and removed. This procedure is then repeated for any other affected sinus. Balloon sinuplasty as a stand alone procedure takes approximately 20 minutes in the office. It may be performed with other procedures including repair of a nasal septal deviation, turbinate reduction, or polyp removal. Dr. Nachlas performing Computer Assisted Balloon Sinuplasty at the Nose and Sinus Institute of Boca Raton. Dr. Nachlas is a double board certified physician (American Board of Otolaryngology and the American Board of Facial Plastic and Reconstructive Surgery) specializing in advanced surgery of the nose and sinuses. He was the Assistant Chief of Service in the Department of Otolaryngology/Head and Neck Surgery at the Johns Hopkins Hospital in 1985 when minimally invasive sinus surgery was introduced into the United States at that institution. He has remained at the forefront in advances in treatment of the nose and sinuses and is one of the country’s experts in balloon sinuplasty. He performed the first in office computer assisted balloon sinuplasty in the United States in his Boca Raton office operatory in 2014 and currently has one of the largest experiences with this technique in the country. To find out if you are a candidate for this procedure, please call Sandy Friedman, Director of Patient Relations of the Nose and Sinus Institute of Boca Raton, at (561) 939-0909.